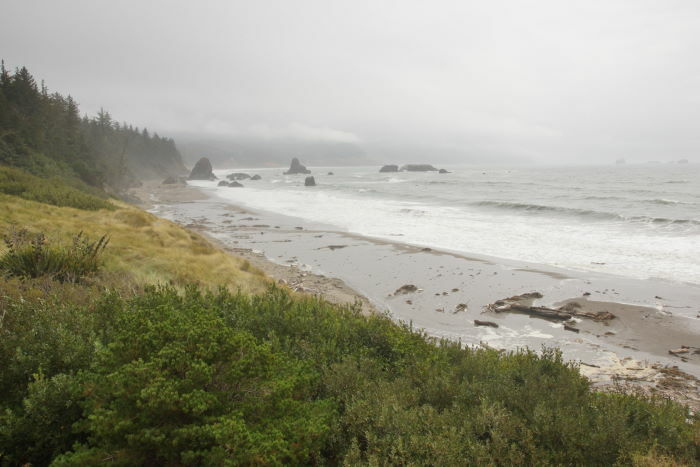 Want to take a quick walk on a beautiful Oregon beach? Or maybe you just need a bathroom break? You can find both at Port Orford, Oregon’s Visitor Information Center. 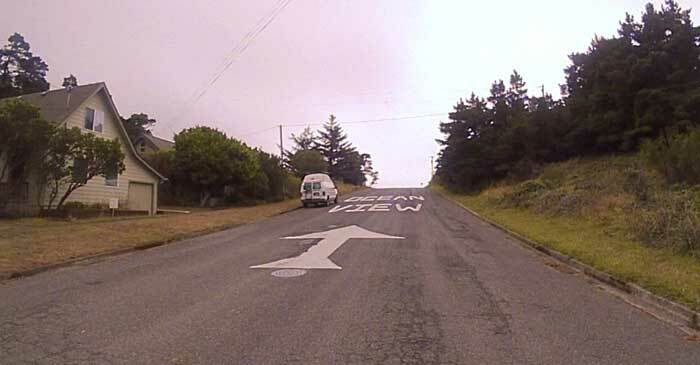 Plus, you won’t want to miss the ocean view at the end of the town’s giant arrow. Port Orford is located on US Highway 101, about 50 miles south of Coos Bay and North Bend. You’ll find the visitor center, restrooms, and beach access on the south end of town. The big arrow is just to the north of the visitor center, but it will only be noticeable to southbound traffic. More than once, the restroom at Port Orford’s friendly visitor center has come to my rescue. But on this trip, I decided to spend a little more time here, and wander down to the beach that’s nearby. 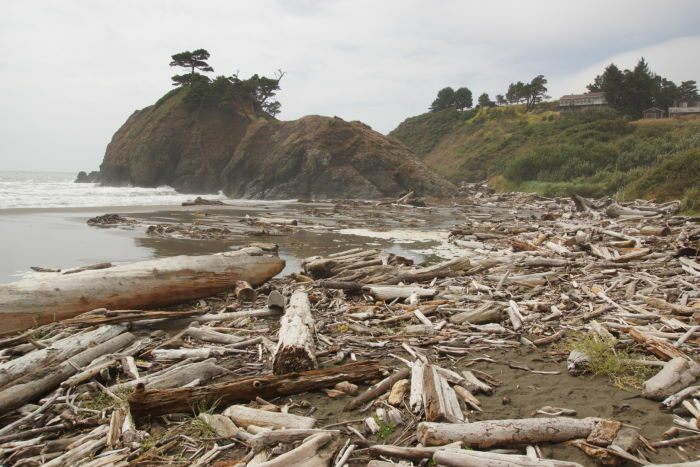 … by wandering down to the shoreline, where plenty of driftwood has piled up. The name “Battle Rock” commemorates an 1851 battle that actually took place on the rock, between 150 Native Americans and nine men from a Navy steam ship. The nine men managed to kill 23 Indians, and escape with their lives. These days, you are allowed to climb up to the top of Battle Rock and enjoy the view, which Port Orford proclaims to be one of the most spectacular on the Oregon Coast. Maybe it is on a clearer day, but thanks to the clouds, I decided to limit the time I spent here. I stopped for gas in town, and as I left, I noticed this big arrow, painted on a side street. As you head south on US 101, the arrow and “Ocean View” will be directly in front of you. It’s impossible to resist the temptation to drive to the top of the hill, and see the view. 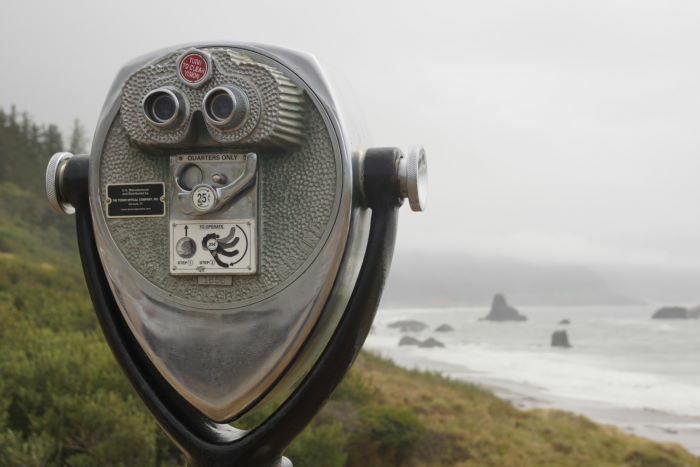 Port Orford is a nice small town with a pretty beach and a convenient visitor center. Be sure to stop and enjoy it.